It’s a dorm room! It’s a sushi restaurant! Jarrett Deutsch serves sushi to his pop-up dinner guests Harrison Arnold (left) and his mother, Catherine Arnold. 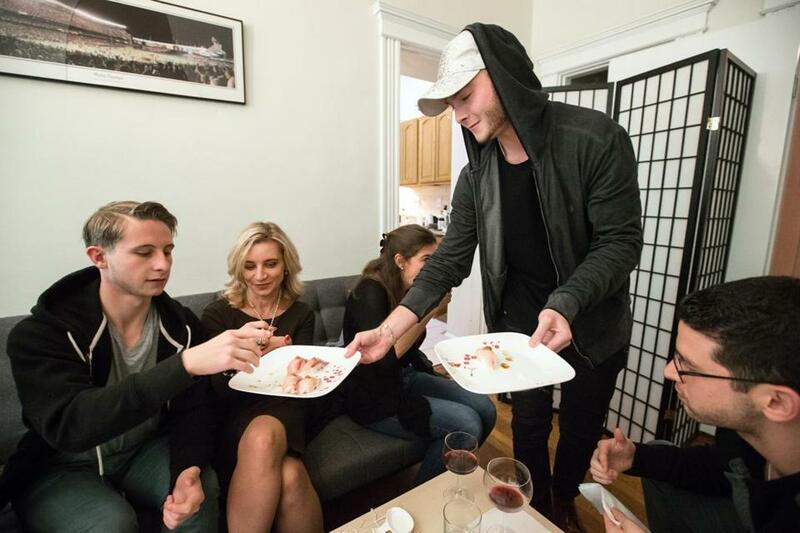 It’s Friday night, and Boston University student Ethan Cole is draping fresh salmon belly over carefully shaped rice while roommate Jarrett Deutsch hurriedly blanches peas at the stove. This is no sushi restaurant. It’s a cramped off-campus apartment. This semester, the two — friends from home in New York City — have been preparing elegant sushi for fellow students, all out of a dorm room. 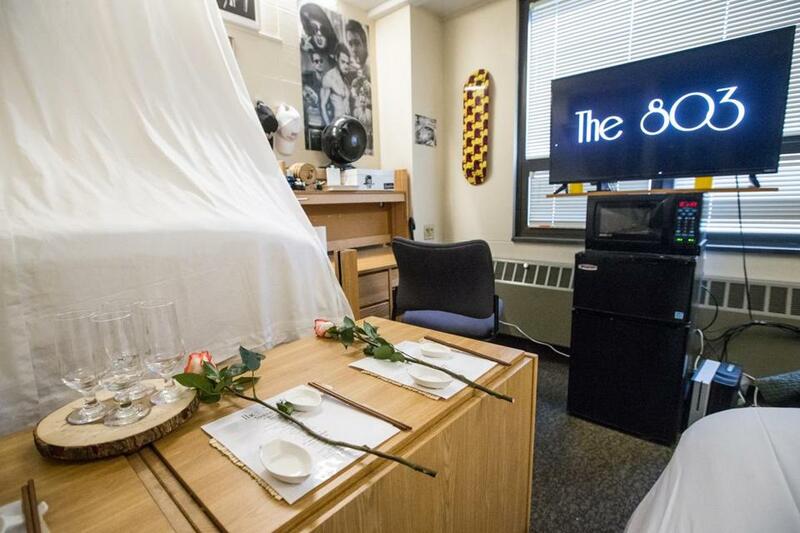 The 19-year-old freshmen started their pop-up omakase restaurant, The 803 (named for their room number), out of a desire to share their love of cooking with their fellow students, and because of their mutual distaste for the food served at the dining hall. Cole says he learned how to make sushi with his family growing up. His dad knew some basic techniques. He taught Cole that it’s best to scoop rice with wet hands, so as to mold it to the right shape without having it stick to your fingers. 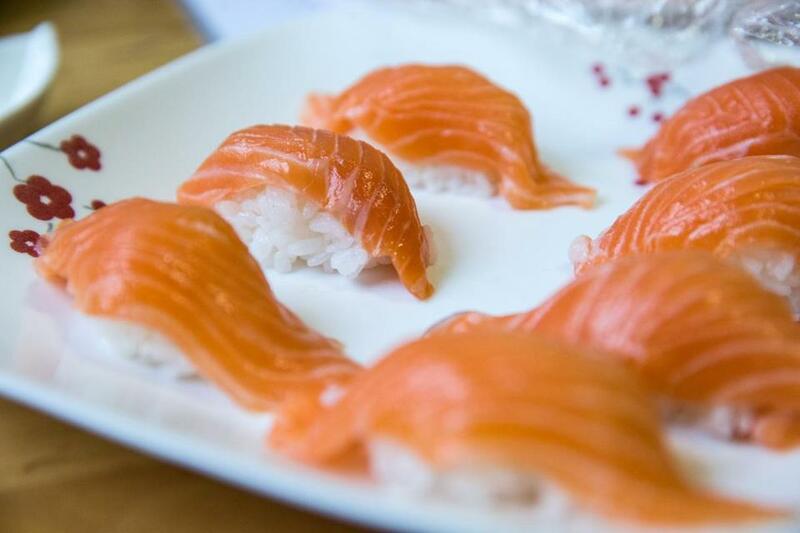 Cole and Deutsch have experimented with their cooking styles: Deutsch has tried out a variety of French sauces and reductions to add to the fish, pushing the boundaries of traditional Japanese sushi. Cole says he likes to add tomatoes, basil, and other greens to his sushi, lending it an Italian flair. This underground Italian-French-Japanese fusion sushi got students at BU talking. This Friday-night dinner is the last of the semester. Working out of a friend-of-a-friend’s off-campus apartment kitchen, Cole and Deutsch frantically boil, blanch, sear, blend, and plate for the first seating of 11 customers waiting in the next room. Behind in their preparation, they are already breaking away from the laminated menus they made for the night, first serving the simple hamachi with black garlic-mushroom puree that was planned for the third course. Seared salmon prepared by Boston University students Ethan Cole and Jarrett Deutsch. While prepping the food, there are no measuring cups or spoons; each adds ingredients until the dish tastes right. Deutsch says this is the most organized they’ve been so far, and it helps working in an actual kitchen as opposed to a dorm room, with more space and appliances at their disposal. “Somehow it always comes together at the last minute,” Deutsch says. When Cole and Deutsch hold the dinner at their dorm, they can only accommodate four guests for each seating. This time, they decided to hold it in an off-campus apartment in order to seat as many guests as possible, without worrying about getting discovered. The fear of getting caught by resident assistants was always a concern, but Jenifer Kurtz, a floormate of the two and one of the guests, says their RA isn’t around much and probably doesn’t know about the sushi restaurant at the end of the hall. That RA may just be the only person on this side of campus who doesn’t know about it, says Elias Goodman, resident of room 804. The dorm room transformed into a restaurant for four. During the first dinner, Goodman came in skeptical, but his skepticism changed to surprise when he realized how good the food was and saw how his neighbors had transformed a dorm room to look like an actual restaurant. Cole and Deutsch added touches like color-changing lights (Deutsch’s favorite design element) and draped sheets from the ceiling to the floor. Dorm-room beds were used as seating for guests. Between the two beds was a low table where plate settings for four were arranged. With Cole and Deutsch juggling homework and cooking, preparation for the pop-up dinners would typically take two days. The food was mostly prepared on the students’ desks, the ingredients stored in the dorm’s two refrigerators — one for the fish and one for everything else. Much of the cooking was done over a teapot warmer. A major challenge: The closest faucet was in the men’s bathroom down the hall. 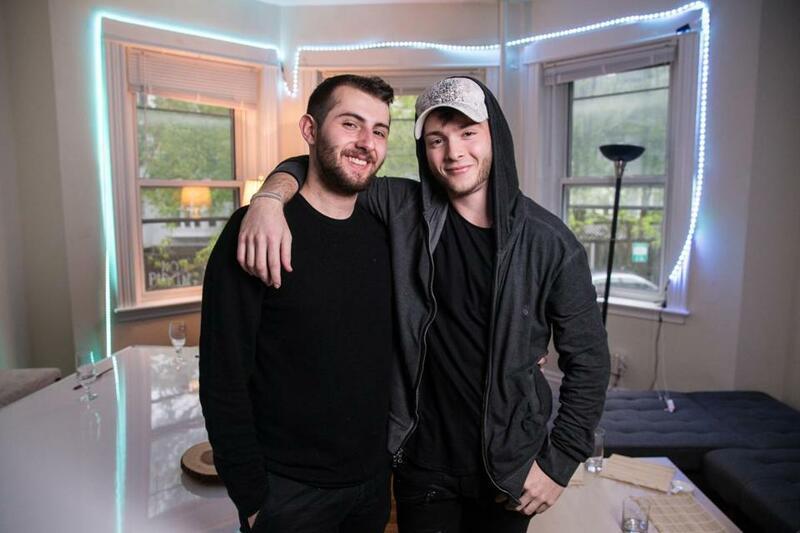 Ethan Cole (left) and Jarrett Deutsch worked in the kitchen at a friend’s apartment for their last pop-up dinner of the semester. Another challenge: The freshmen lack proper sushi knives, so when they buy the fish at the Japanese fish market Sakanaya in Allston, the seller there — with whom Cole and Deutsch have developed a good working relationship — cuts it for them very skillfully. “The fish market has a lot of pre-prepped fish lying out, but we usually call beforehand and [the seller] cuts it all fresh to ensure we are getting the best we can get from him,” Cole says. Even though this is the last dinner of their freshman year, the two already have plans for a concept in the Hamptons, where both of their families have houses and spend time every summer. The friends have been disappointed in the Japanese dining options there, and plan to help fill the gap. As for next year, Cole will be living off campus, making it easier for the two to hold their pop-up dinners more regularly. Cole, a film and television major, says he doesn’t think he’ll be a sushi chef long-term; he wants to work in the field he is studying. Deutsch, who hasn’t chosen a major yet, says he would love to open a restaurant after he is financially stable. “I would pursue it now if I didn’t think it was too risky, but I’m confident I’d be a good chef,” Deutsch says. Whatever the future holds for the two, their dinner Friday night is a hit. The close seating allows for conversation to flow among fellow floormates, students who found out about the restaurant via Instagram, and family members. None of them notices the chaos happening in the adjacent kitchen. Each time Deutsch brings out a plate holding 11 pieces of sushi, the room falls silent, each guest gingerly picking up a piece with their hands. Boston University freshmen Ethan Cole (left) and Jarrett Deutsch.